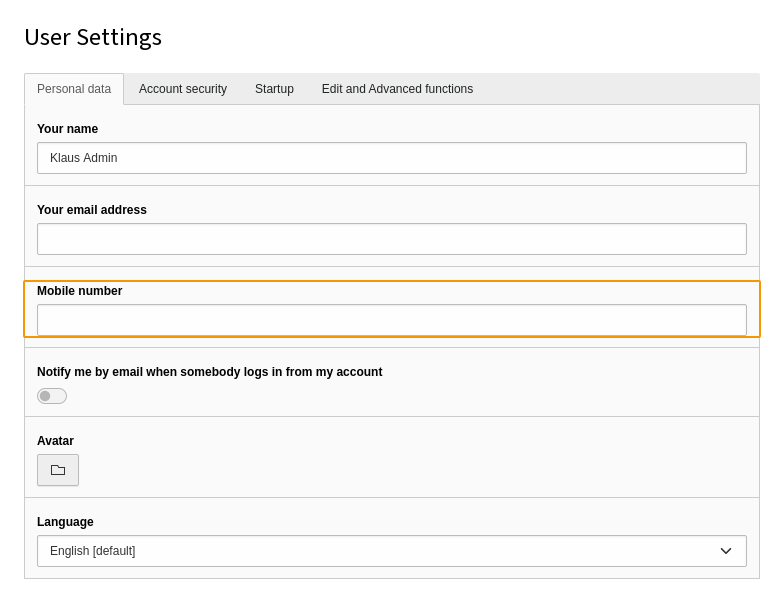 Adding fields to the User Settings is done in two steps. First of all, the new fields are added directly to the $GLOBALS['TYPO3_USER_SETTINGS'] array. Then the field is made visible by calling \TYPO3\CMS\Core\Utility\ExtensionManagementUtility::addFieldsToUserSettings(). The configuration needs to be put into ext_tables.php. The second parameter in the call to addFieldsToUserSettings() is used to position the new field. In this example, we decide to add it after the existing "email" field. In this example the field is also added to the "be_users" table. This is not described here as it belongs to 'extending the $TCA array'. See label 'extending' in older versions of the TCA-Reference.